co-worker surprises, fund-raisers or any occasion. mind and open eyes for bases for small candy bouquets. toothpicks for really little candy), and foam. bouquets is colorful plastic disposable drinking cups. Team Spirit (my favorite team is Auburn...colors orange and blue). ...red metal pail from Dollar Tree; purple silk pail from thrift store. 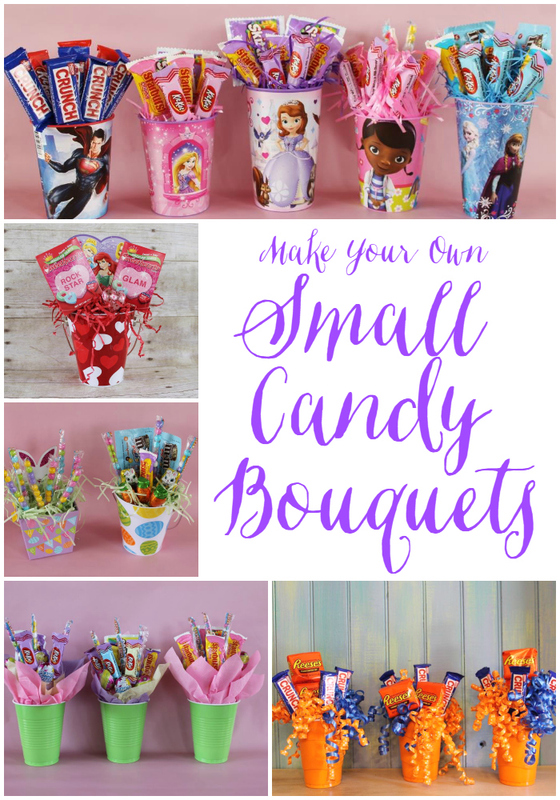 are a great resource for these small candy bouquets. These are Easter candies pictured above. It is better to used wrapped candies for the candy bouquets. "sandwich picks". They are larger than toothpicks but smaller than most wooden skewers. attach the wooden skewer to the back of the wrapped candy. With some of the mini candy bars, there is a flap on the back. over the skewer, tape the flap down. plastic cocktail "forks" at Dollar Tree which worked also. or styrofoam (which is white or green). All of the above foams came from the floral aisle at Dollar Tree. Any of them would work for a small candy bouquet. paper liner on top of the same type foam to disguise it. into spray insulation foam as a filler..
"How To Use Spray Foam As A Filler For Candy Bouquets"
on the skewer/toothpick/plastic fork more than the candy. far beyond that monetary amount. and message hearts boxes (33 cents each). into cups before foam was added. Easter cups (4/$1) with candy and Easter grass added on top of foam. add some glue to the bottom of the cup to help hold the foam. For cups that folks might want to re-use, don't add glue. 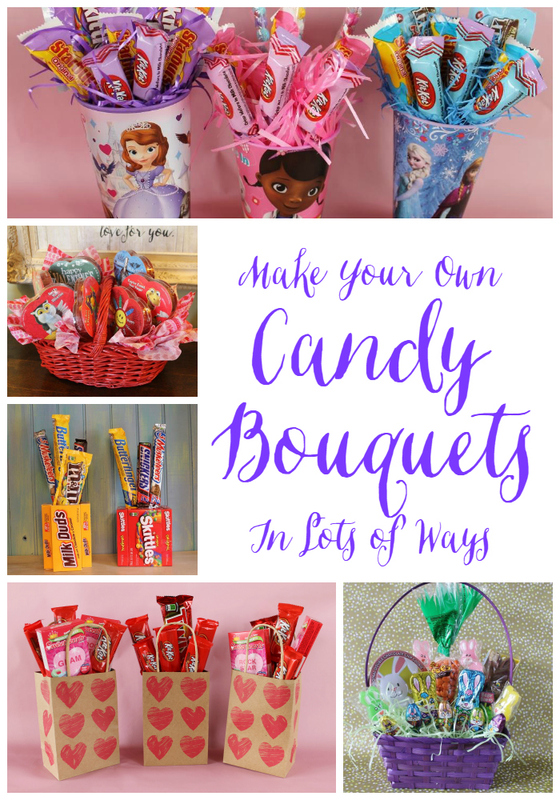 "Make Your Own Candy Bouquets In Lots of Ways". How very cute and simple. Thanks for sharing. Candy bouquets are lovely gifts for any occasion. Thank you, thank you for the information and for sharing so many details. I will be making lots of these!! I love the orange cups with the crunch bars! Where did you find the curly ribbon with the silver dots? ?